The most striking aspect of the St. Lucia information and communication technology (ICT) market is the rapid growth of mobile. Competition to the incumbent Cable & Wireless was introduced in March 2003 when Digicel-an Irish-owned, pan-Caribbean mobile company-entered the market as the second operator. AT&T Wireless launched its operation a month later. Six months after the introduction of mobile competition, the telecom regulator reported 132'700 subscriptions, resulting in a penetration rate of 83 per cent of the population. An amazing result, considering that the number of mobile subscribers per 100 inhabitants stood at only nine in December 2002. Coverage is over 90 per cent of the population and there are now more mobile than fixed telephone subscribers. The intense competition has resulted in among the lowest mobile tariffs in the region. It is notable that mobile operators were allowed to provide their own international services. As a result, international call prices have dropped significantly. St. Lucia, is Small Island Developing State (SIDS) is an example of the new competitive environment that has spread to members of the Organization of East Caribbean States (OECS). The regional telecommunication regulator, the Eastern Caribbean Telecommunication Authority (ECTEL), has been instrumental in this transformation through licensing guidelines and negotiations with the incumbent operator to accelerate liberalization. The entry of multiple mobile operators in all of the ECTEL members-whose five members have a total population in the vicinity of half a million-refutes the historical argument that small market size is a barrier to competition. Although St. Lucia's entire telecommunication market is theoretically liberalized, competition has developed only in mobile and international services, and so far not spread to other market segments. One project that will help St. Lucia's transition to an information society is the Public Sector Reform Project, financed with external assistance. It has an ICT component that calls for enhancing e-government services. 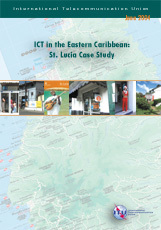 St. Lucia already ranks high in e-government in the region with all ministries linked on a government network. The nation's tertiary institution, all secondary and almost all primary schools have Internet access through an educational network. It is envisioned that the future universal service policy would include provisions for providing broadband access to schools and other localities such as libraries and post offices. A mission to St. Lucia was carried out from 15-19 December 2003, involving Michael Minges, Vanessa Gray, and Philip Cross. The mission and interviews were coordinated with the Ministry of Communications, Works, Transport and Public Utilities.